Edgar Mason is a practical man, discharged from the military and now eking out a living as a butler-for-hire. Booked for the evening to wait on Agamemnon Frost, Mason soon discovers that there’s more to his temporary employer than meets the eye. Not only is he attracted to the man – at a time when gay relationships were illegal – but Frost has an ulterior motive. He believes the dinner part to which he’s been invited is hosted by aliens. So the scene is set for the first story in the AGAMEMNON FROST trilogy. Told in first person from the POV of Mason, this novella has delicious overtones of Sherlock Holmes, while the face-changing aliens give the historical setting a science fiction twist that wouldn’t seem amiss in a Jules Verne novel. 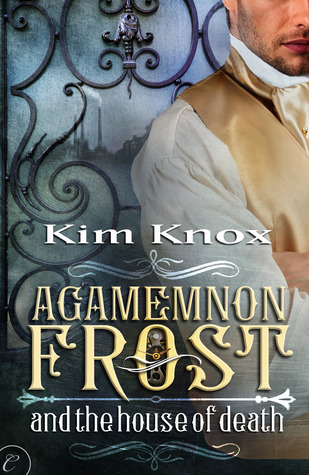 Knox combines those elements with a sprinkle of Steampunk and the LGBTQ aspect to create a world very much her own. AGAMEMNON FROST AND THE HOUSE OF DEATH is a fast-moving story that mixes action with sexual tension that practically set my Kindle alight. The novella length is perfect – telling enough to satisfy while leaving the reader eager for more. I await sequel AGAMEMNON FROST AND THE HOLLOW SHIPS with much anticipation.